Writing in the Guardian newspaper today, Valentine's Day, Tahir Shah gives a glimpse of a Moroccan festival with plenty of romance. If Morocco is a land of romance, then its heart is surely the remote Berber village of Imilchil – without doubt the most romantic place I have ever been. Nestled in the Atlas, it lies beyond the Gorge of Ziz, in a wild and unforgiving frontier of narrow passes and sweeping mountain vistas. Once each year, in September, a festival is held in which the young are permitted to choose a spouse for themselves. 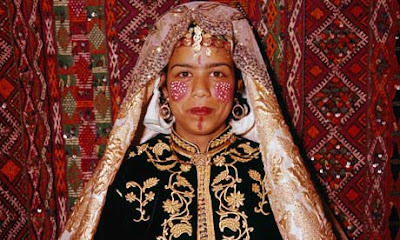 In a realm usually confined by tribal tradition, the would-be brides and grooms are free to pick whoever they wish to marry. Dressed in roughly woven black robes, jangling silver amulets and amber beads heavy around their necks, the girls stream down from their villages. There's a sense of frivolity, but one tempered with solemn apprehension as they approach the doorway to a new life. Reaching the village square, they catch first sight of the grooms. All of them are dressed in white woollen robes, their heads bound tight with woven red turbans, their eyes darkened with antimony. The betrothal festival owes its existence to a legend, itself a blend of love and tragedy – a kind of Moroccan Romeo and Juliet. The story goes that, forbidden to marry, a couple who hailed from feuding tribes drowned themselves in a pair of crystal-clear lakes called Isli and Tislit. (One version of the tale says the lakes in which they drowned were made from their tears.) So horrified were the local people at the loss that they commenced the annual festival. No one is quite sure when the tradition began, but everyone will tell you that the marriages which follow betrothal there are blessed in an almost magical way. The first time I visited Imilchil, almost 20 years ago, I met a young couple, Hicham and Hasna. They had met, fallen in love and been betrothed all on the same morning. They were glowing, their cheeks flushed with expectation and new love. Last year, when I visited Imilchil again, I tracked down the pair. They look a little older now. Hicham's hair has thinned and his face is lined from a life outdoors tending his goats; and Hasna looks fatigued. But then she has given birth to six children, four of them boys. As we sat in the darkness of their home, a wooden shack clinging like a limpet to the mountainside, I asked them how the years had been. Hicham looked across at Hasna, and smiled. "On that day all those years ago," he said, "I became the happiest man in all the world. And each day since has been conjured from sheer joy." He glanced at the floor. "Do you want to know our secret?" he asked me bashfully. I nodded. Hicham touched a hand to his heart. "To always remember the love of the first moment, the tingling feeling, the first time it touches you, and the first moment your hands touched." A few days after leaving Hicham and Hasna at their home in Imilchil, I reached my own home overlooking the Atlantic, in Casablanca. As I stepped in the door, my two little children, Ariane and Timur, ran up and threw their arms around my neck. They asked where I'd been. I told them about the winding mountain roads, the Berber villages, and the Gorge of Ziz. "And what did you bring?" they asked both at once, straining to look sheepishly at the ground. "I brought you a secret," I said. "What is it, Baba?" "Always to remember the feeling of tingling love," I said.